Shiner says she's on a special diet right now. It's called the "seafood" diet. Yep, I'd have to say this is a true statement! She's highly devoted to eating any food in sight. Technically, she is eating an actual seafood diet too - Merrick's Grain Free Real Salmon and Sweet Potato dry formula. If you haven't joined our giveaway to win a year's supply of your choice of Merrick dog food yet, just click here to enter! The see-food diet is definitely the easiest to follow! You look great Shiner. I am on that diet too - high paws!.... I see ANYTHING that resembles food - CHOMP! I also scout kitchens and floors for any semblance of food - WOOF! LOL I am on a seafood diet, I see it I eat it. Have a wonderful Wednesday. That is a GREAT diet! LOL, her and Torrey are on the same diet. That's been Leo's life long story! Aww, she's so cute. I joined your Merrick giveaway! We like that diet here too! Hee hee! 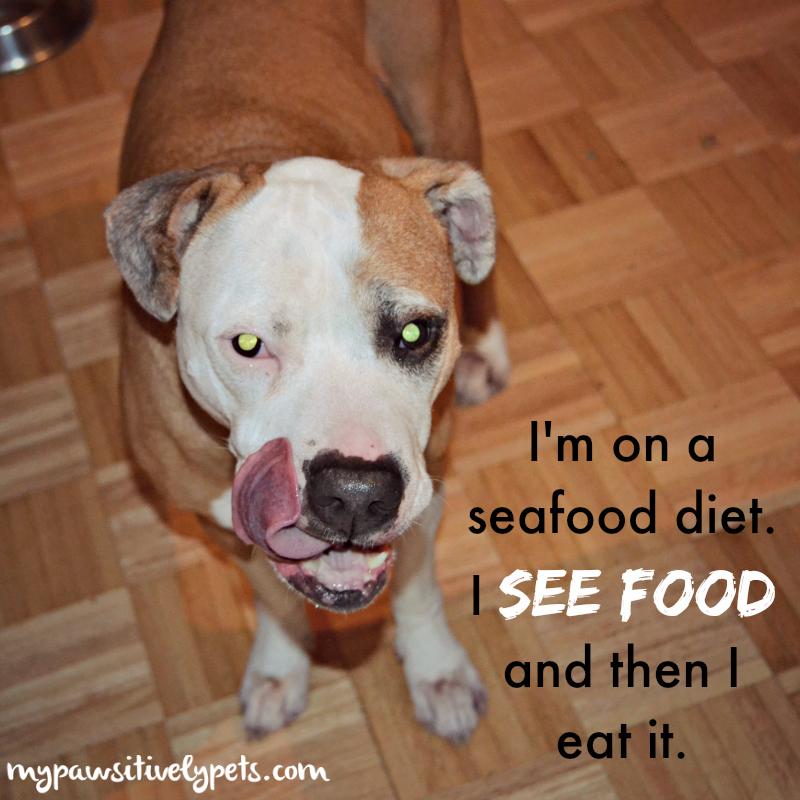 We love that see-food diet, too, Shiner! It is one of the more popular diets. My bulldogs are on the same diet! shiner...nothin better N a salmon diet less it be a flounder N friez diet !!!! I am on that same diet! Shiner is so cute and my kind of doggie - wants to eat! That sounds like a pretty yummy diet! Shiner is a very lucky doggy :) I love the photo! We have a cat on the same diet....see food, eat food, more food (please). hahaha great! me TOO! Did you get your collar yet? Yes yesterday! We shared a pic on instagram but will have to share it some more. Haven't been on the internet much today. Pug is familiar with that plan.